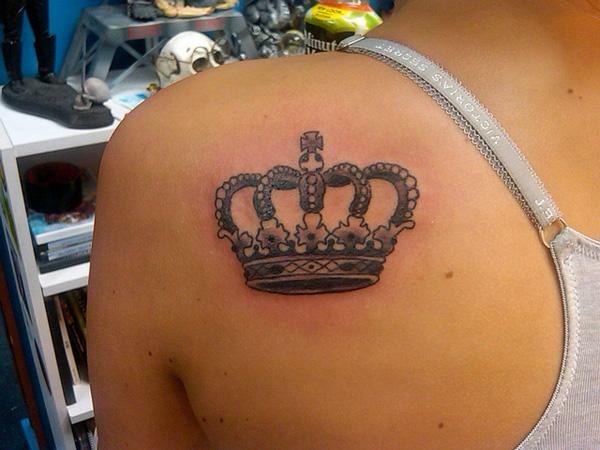 If you’ve always felt like a queen or a king, plus you’ve always wanted a tattoo – a crown symbol is the right choice for you! 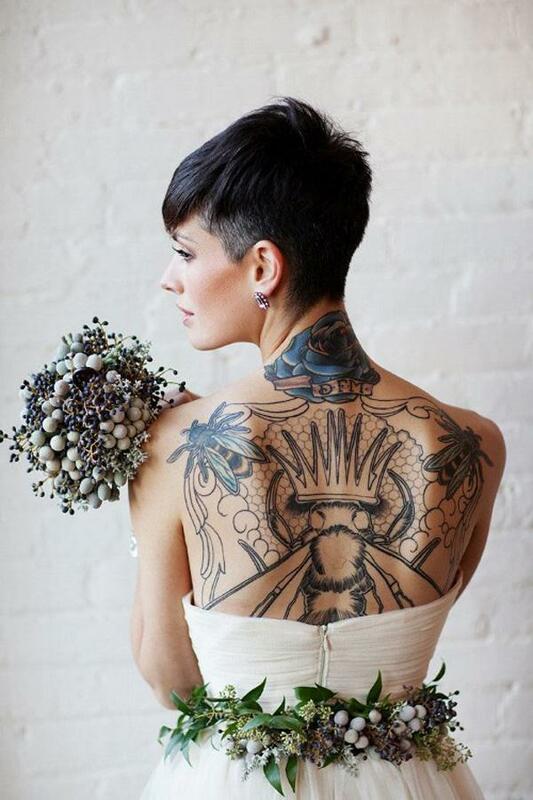 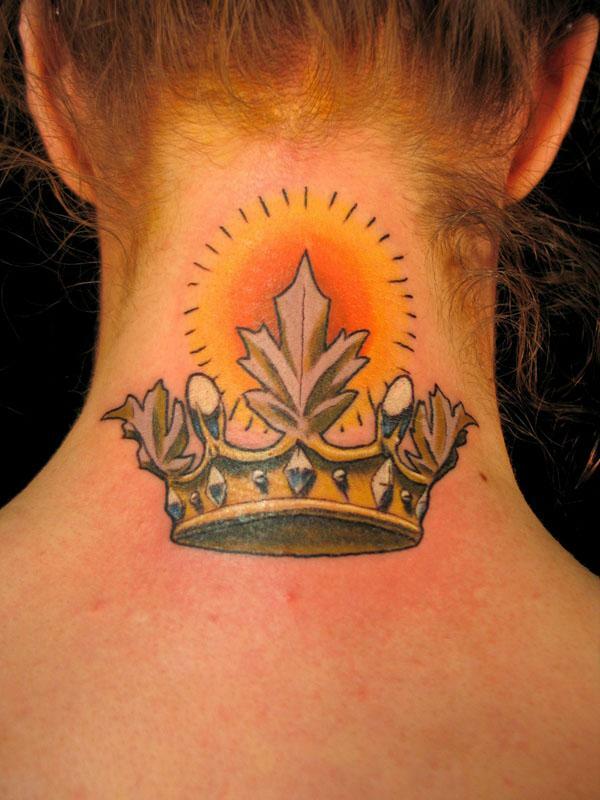 Having such a strong visual appearance and oozing with symbolism, crowns have been a part of tattoo imagery for decades. 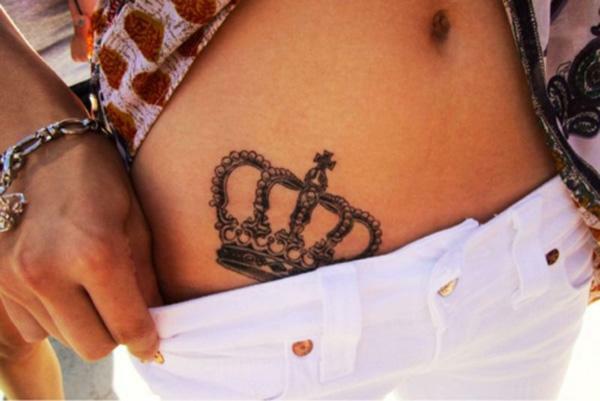 As an object, crown is the emblem of a ruler, standing for his or hers dominion and sovereignty. 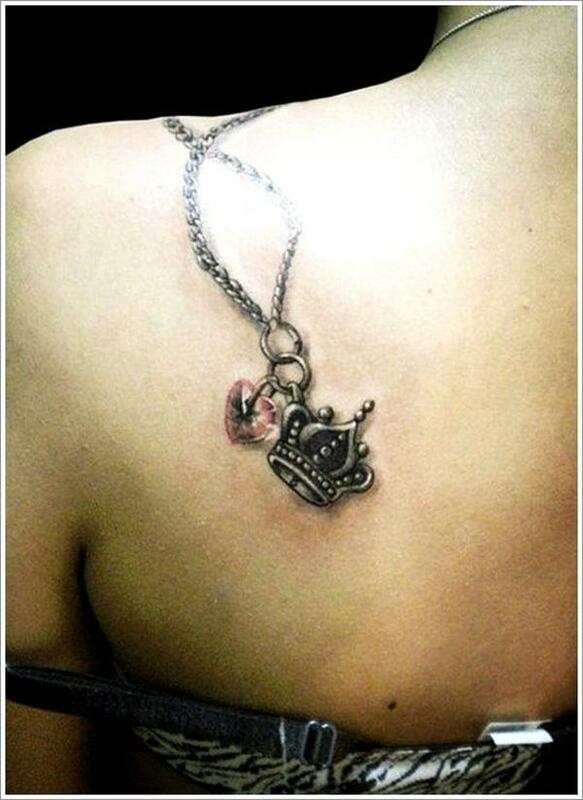 Symbolic from the very start, it was no surprise the image translated onto the skin embellishing arts, in the form of simple or more elaborate crown signs. 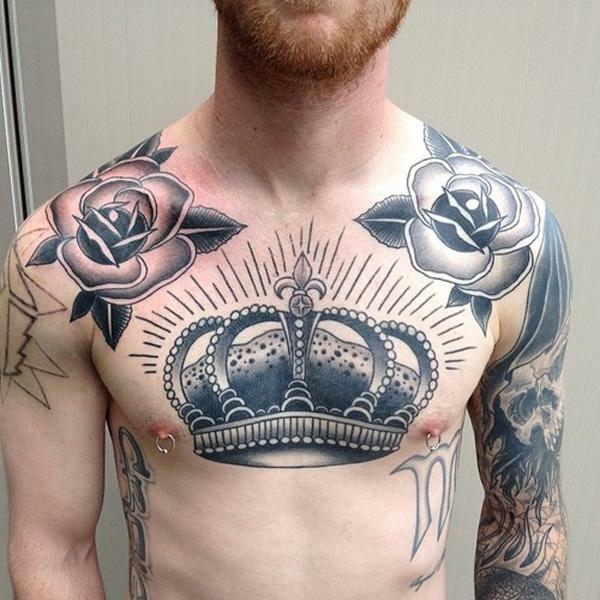 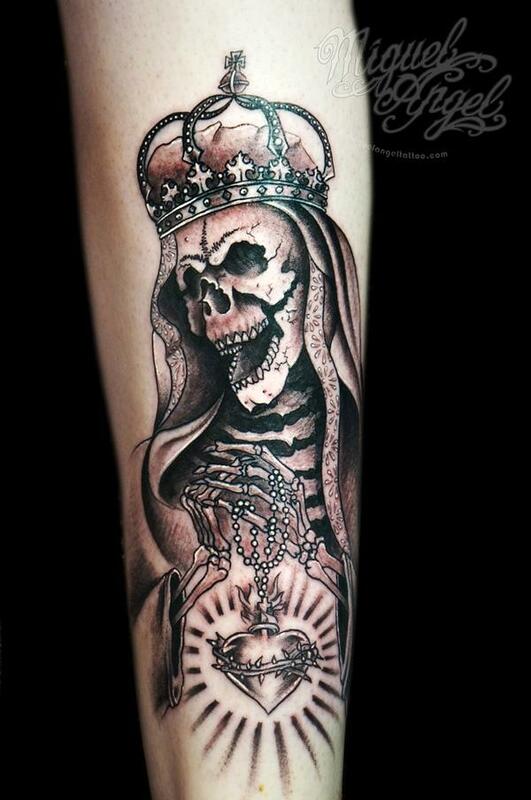 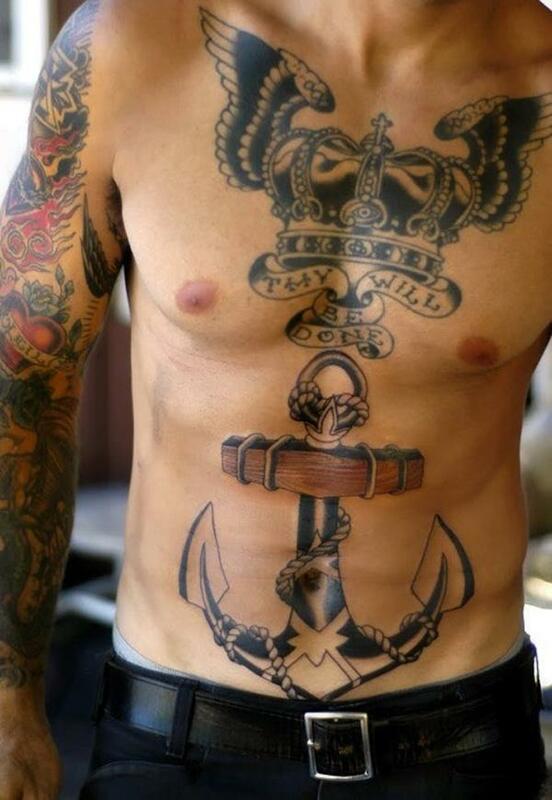 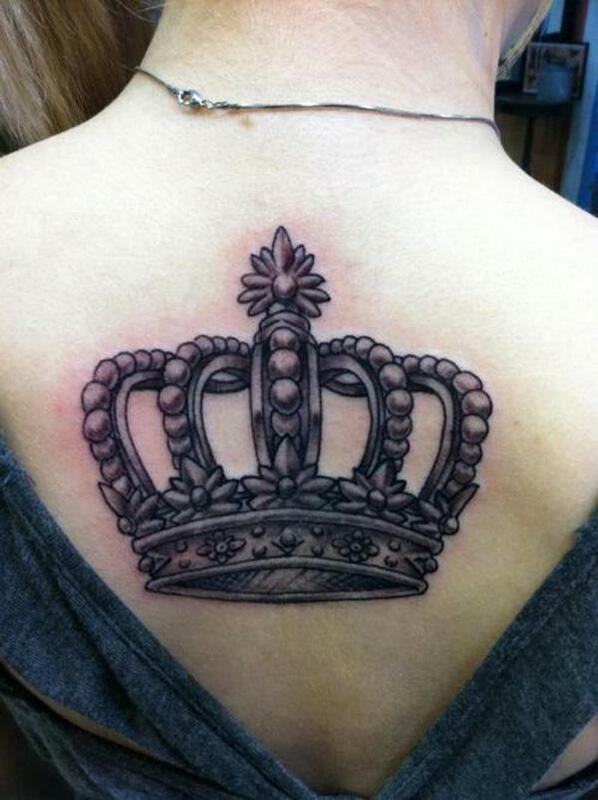 Although it’s often used as an addition to complex tattoo compositions, crown tattoo can stand alone. 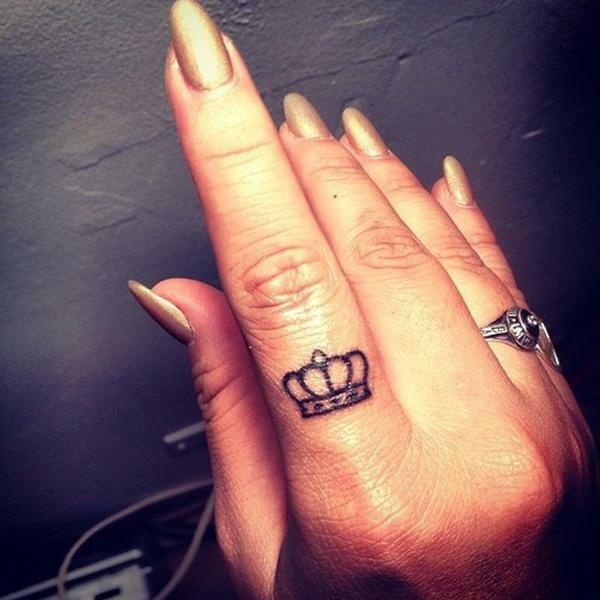 Perceived differently by thousands of people who wear it, crowns are designed in various manners, from the simplest black stamps, to the borderline-kitchy pictures adorned with extra jewels, flowers, heart-shaped trinkets and other personally important visuals. 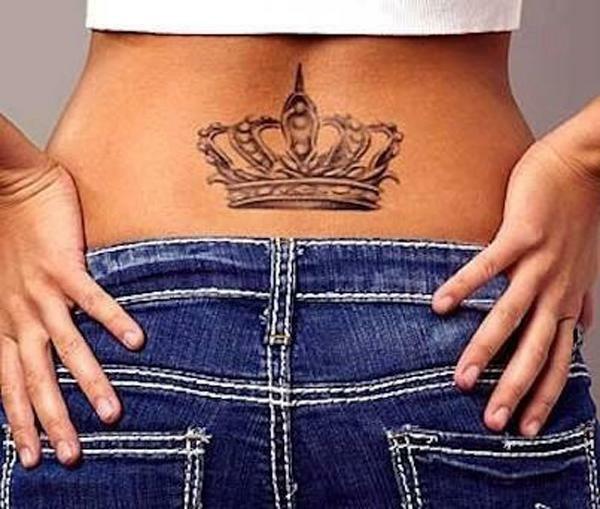 The most usual meanings of a crown tattoo are drawn from the symbolism of royalty – whereas one sees him/herself as singled out, special, striving towards high personal goals. 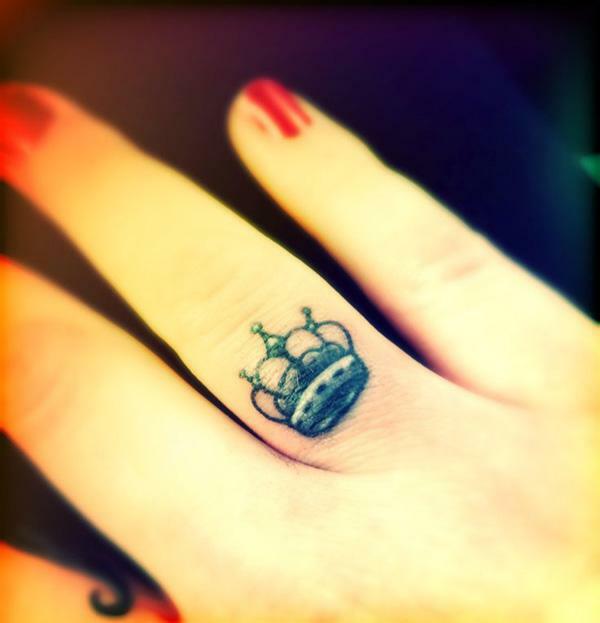 Bearing a plethora of meanings, crown tattoos can be either large, covering an entire back, or tiny, just a mark on the wrist or ankle. 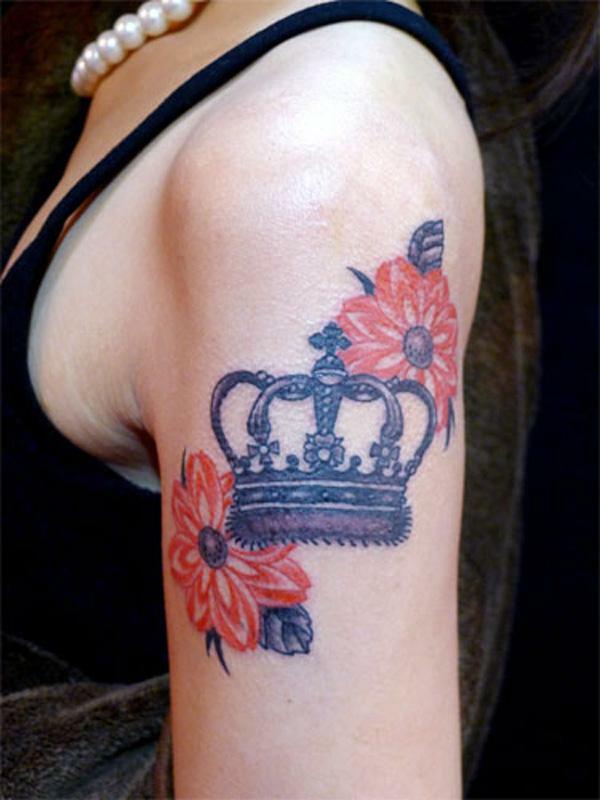 Virtuosity of tattoo artists can be identified in both small and big crown tattoos, although the smaller ones do not allow for many details. 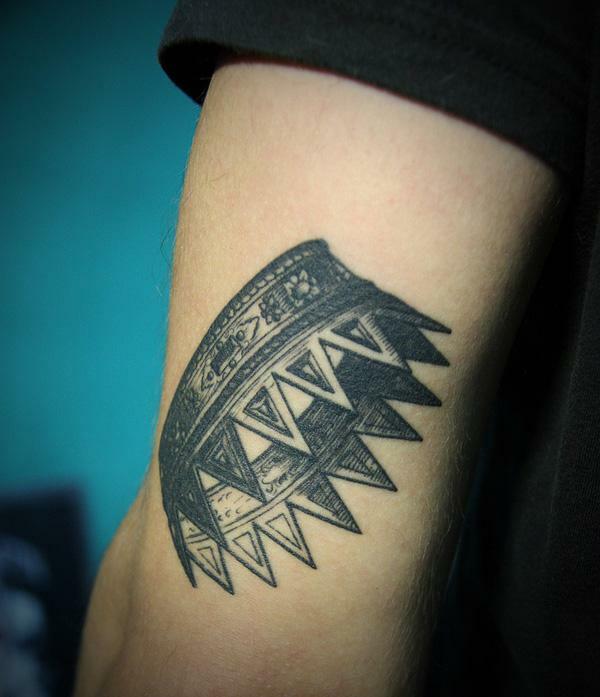 Despite of basic shape, small tattoos are chosen frequently, placed on the back of the neck, on wrists, ankles and other significant or suggestive skin portions. 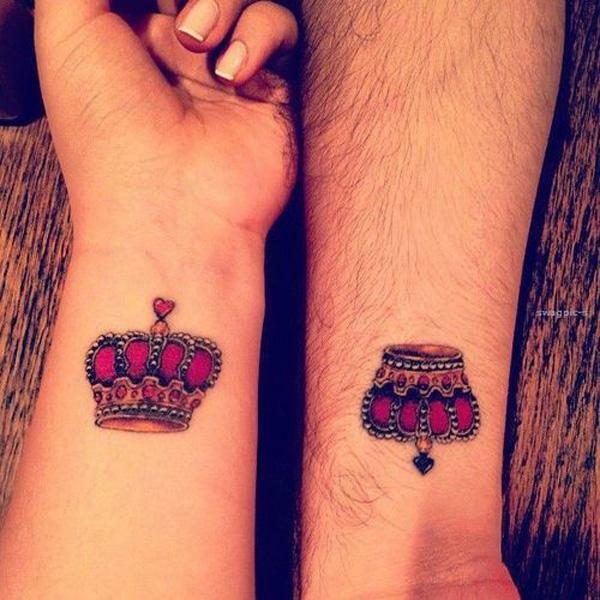 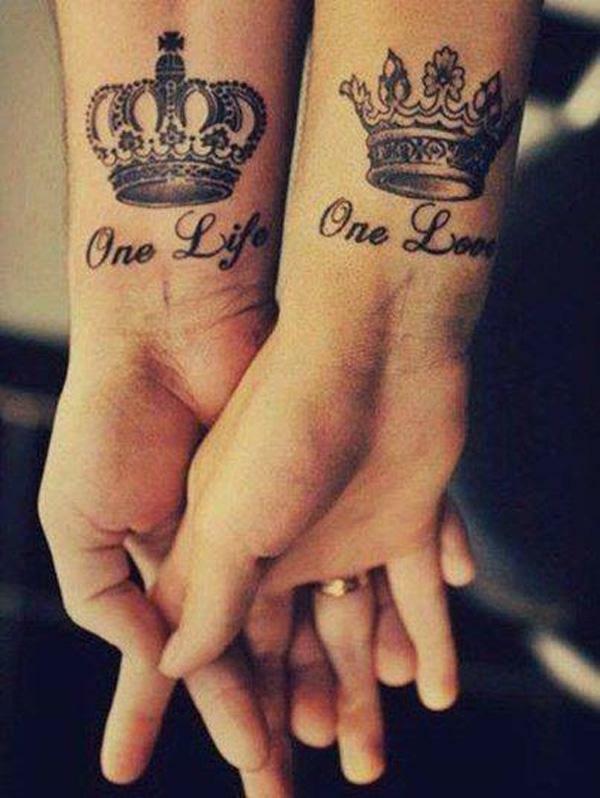 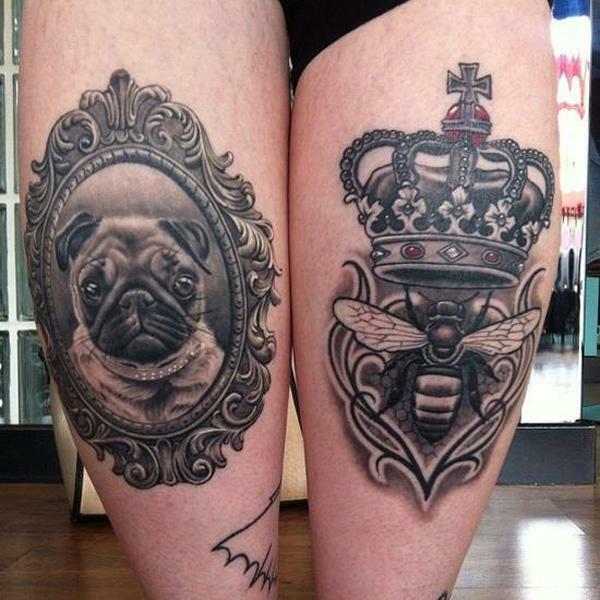 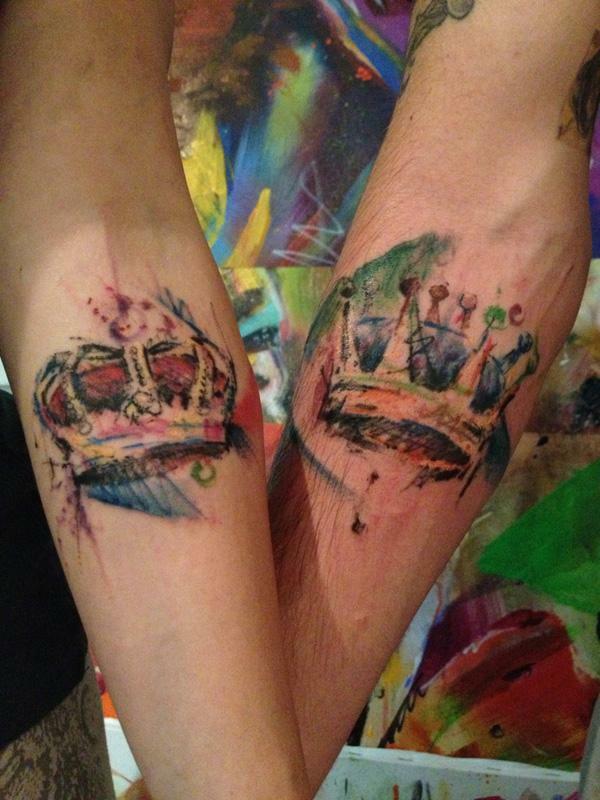 Occasionally, crown tattoos are done in pair, where a couple has identically placed ink art, designed according to their gender, thus identifying as king + queen. 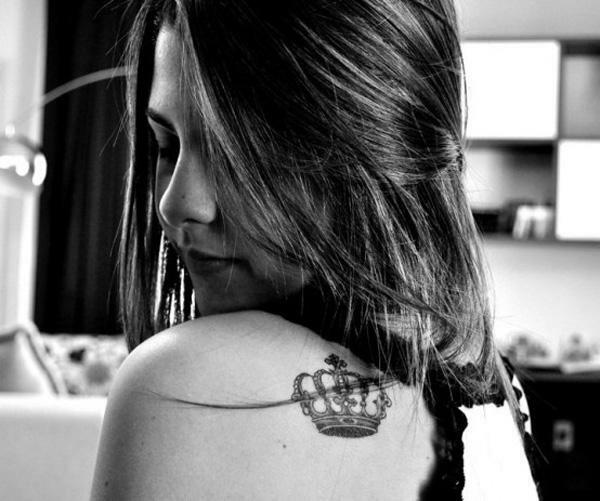 Shifting away from its original meaning of the divine authority grant emblem, crown tattoo is highly personalized, as all other ink marks are. 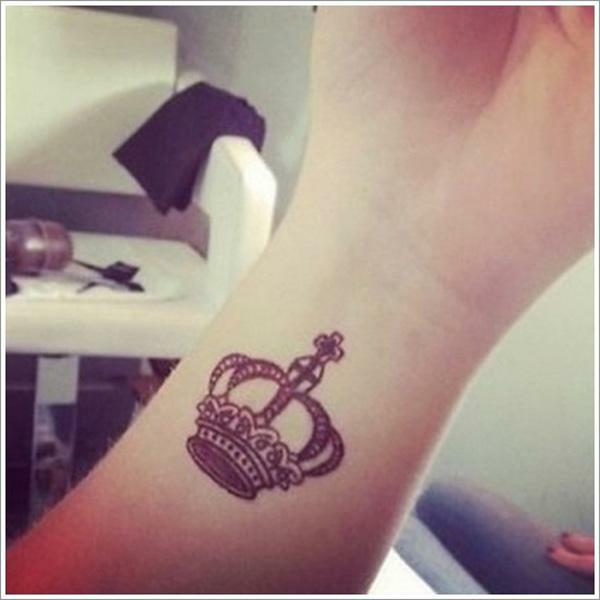 It can be a joint sign of a certain group, symbolizing its power or leadership. 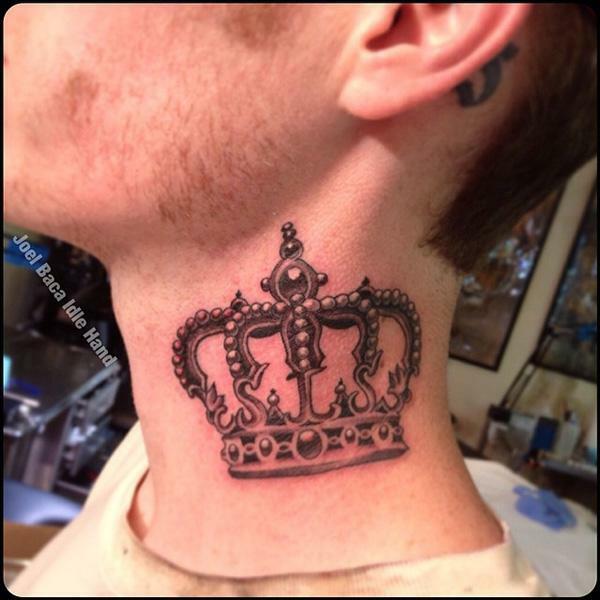 In personal hierarchy, it’s an aspiration for royal status, symbol of pride and nobility. 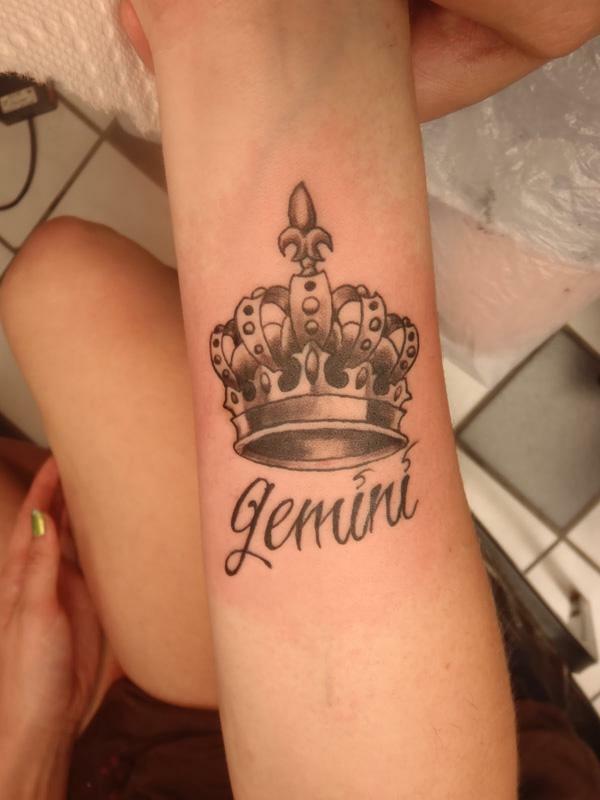 It also stands for ruling of one’s own life, emotionally elevated status, noble thoughts and actions, righteousness and control, a taming element reminding its bearer to use his/hers power in the wise and just way. 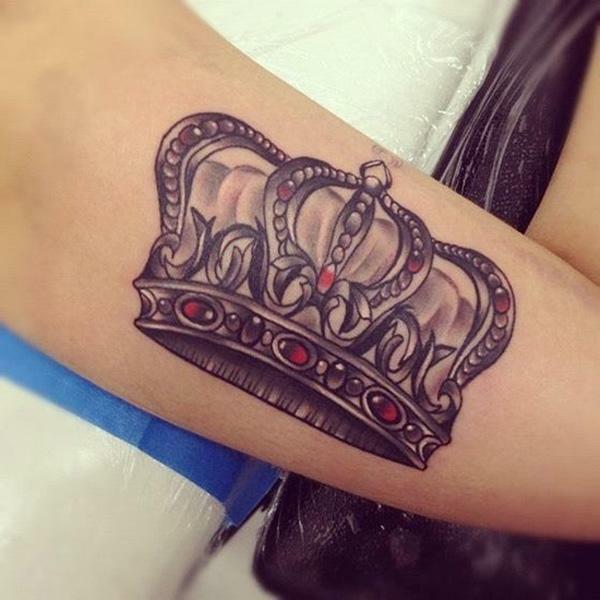 Crown + Flowers + Letters = Princess! 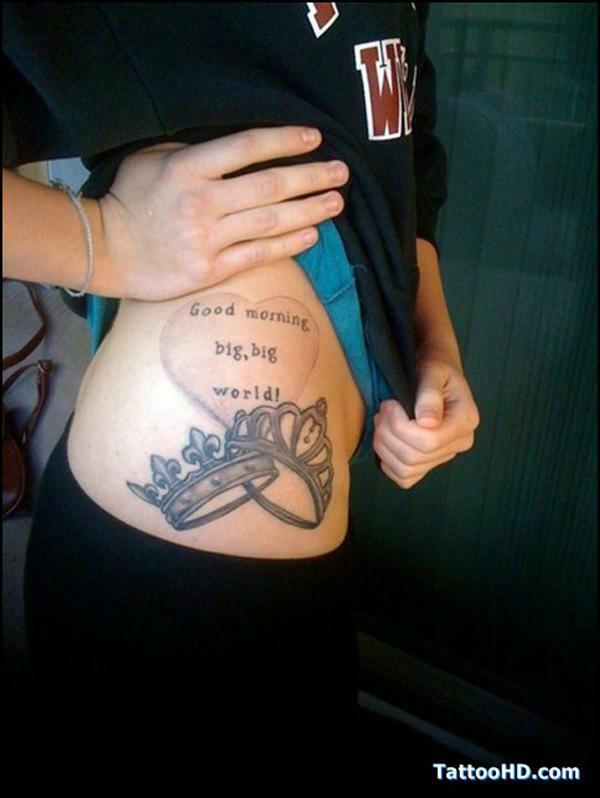 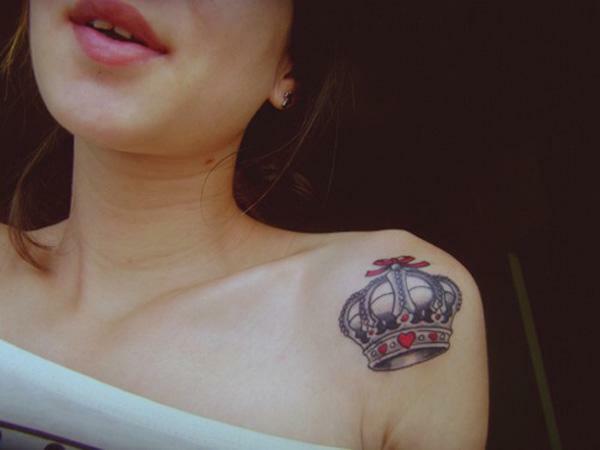 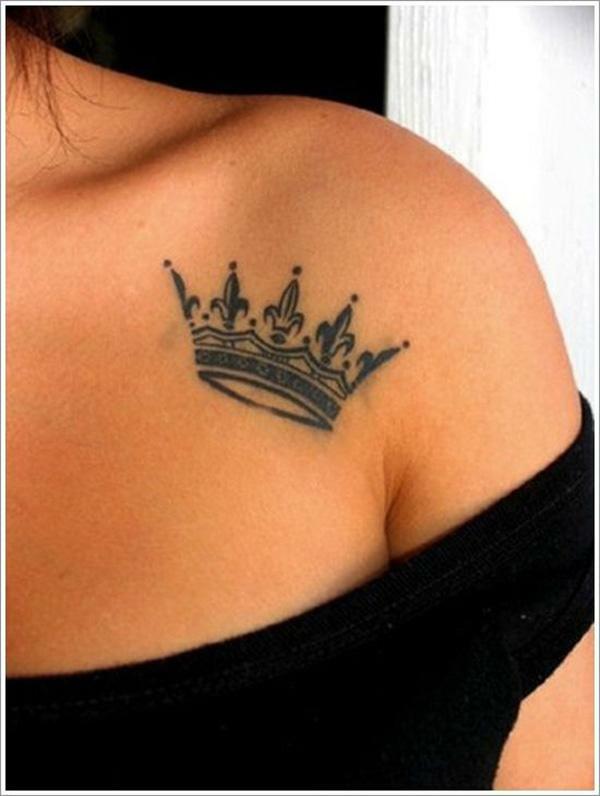 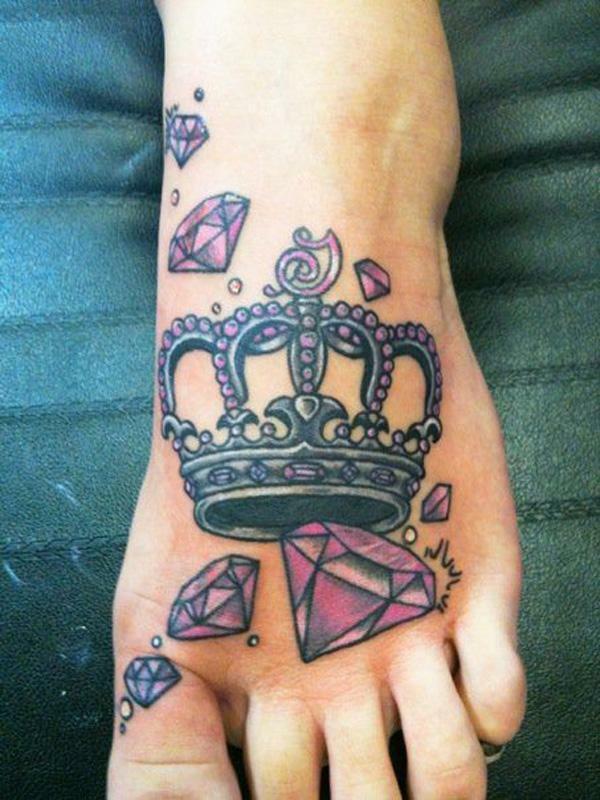 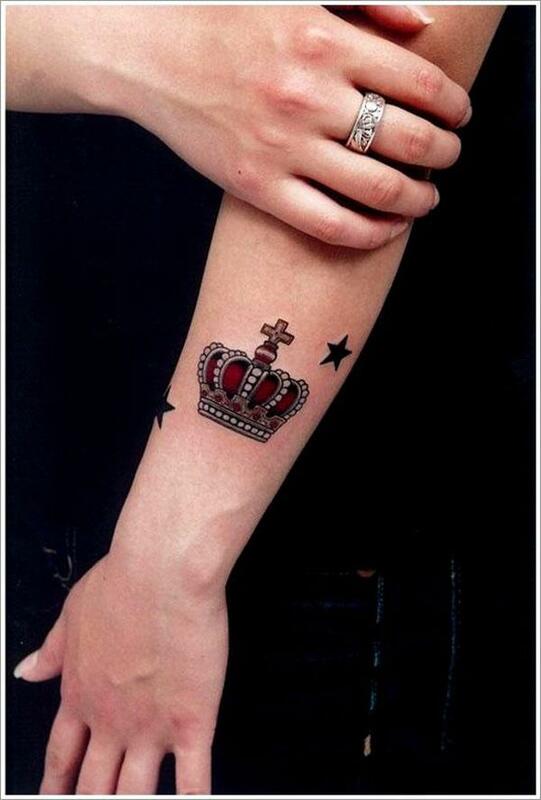 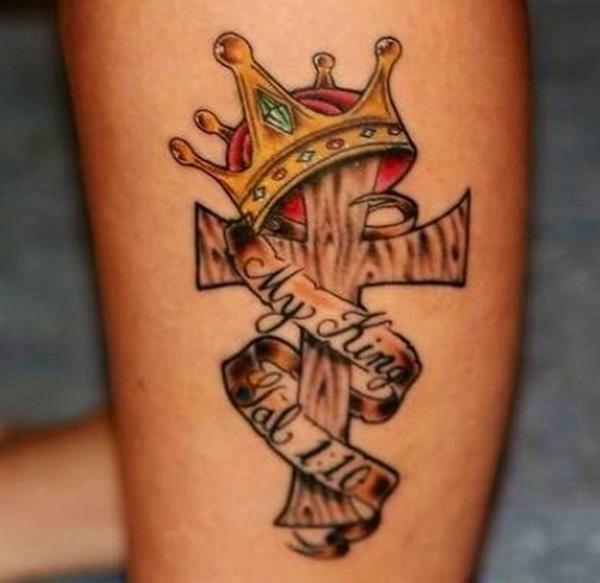 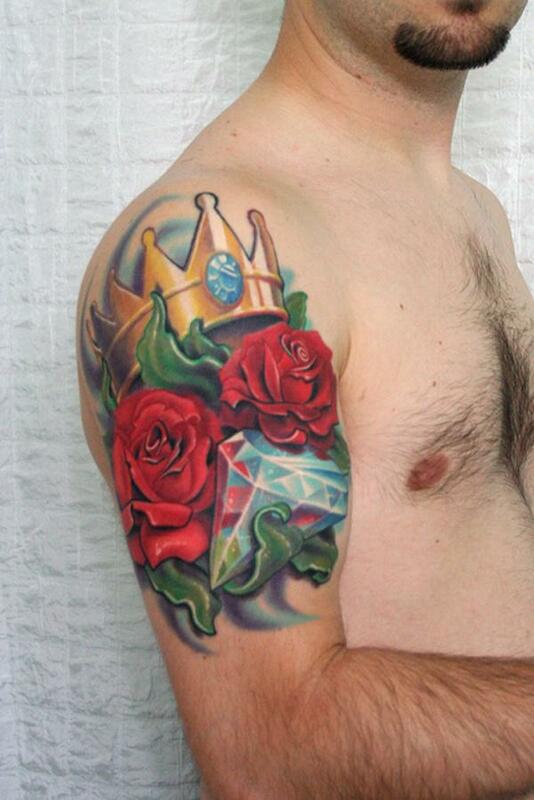 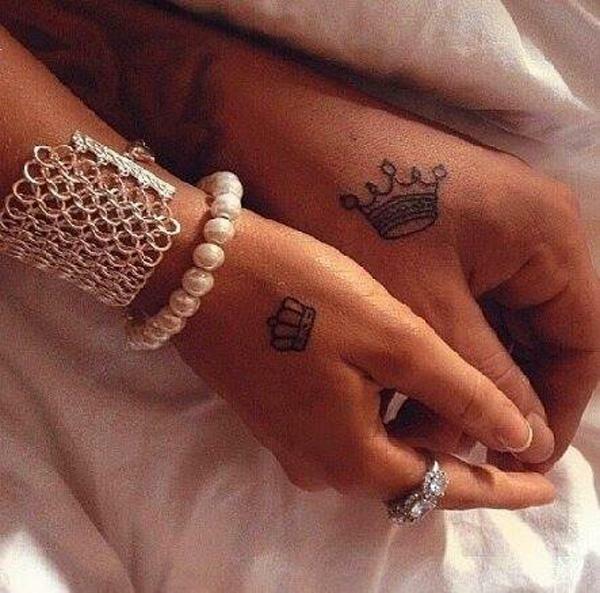 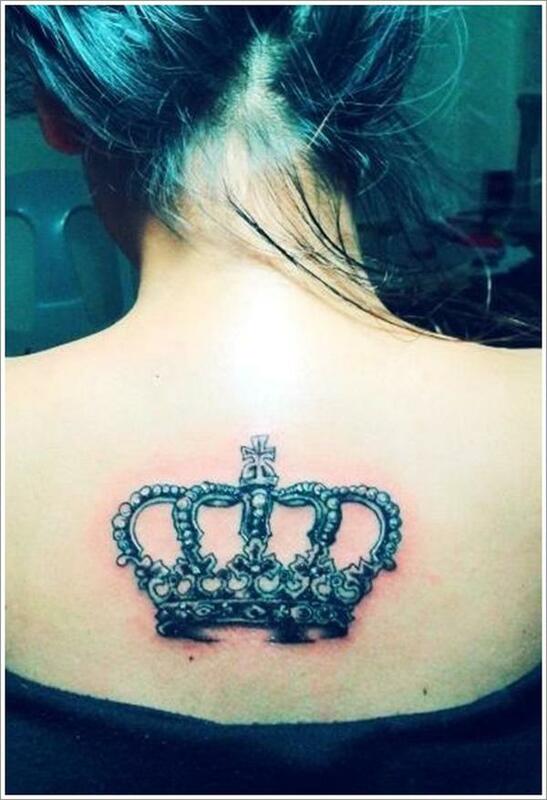 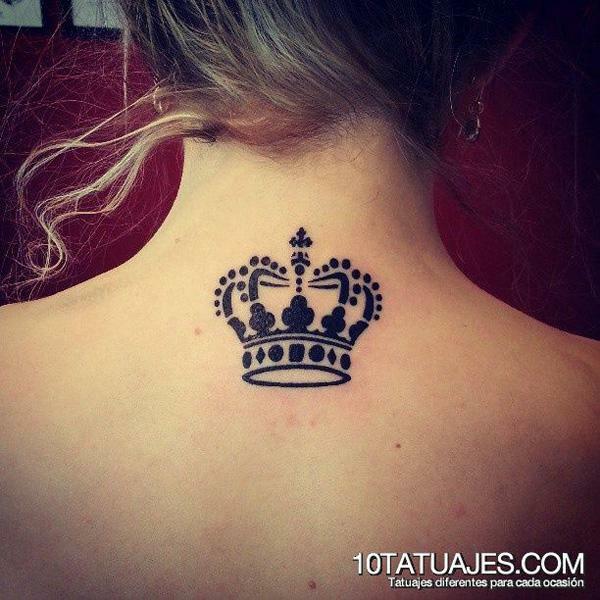 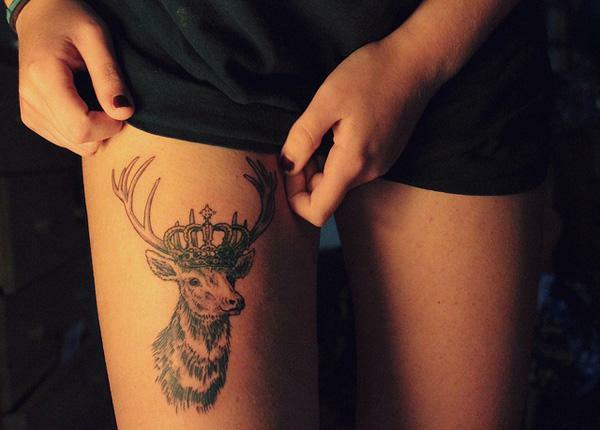 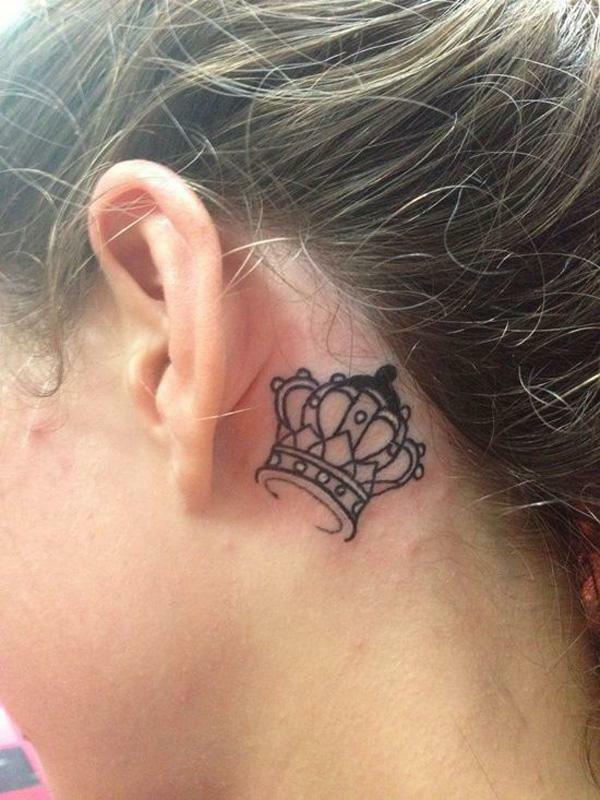 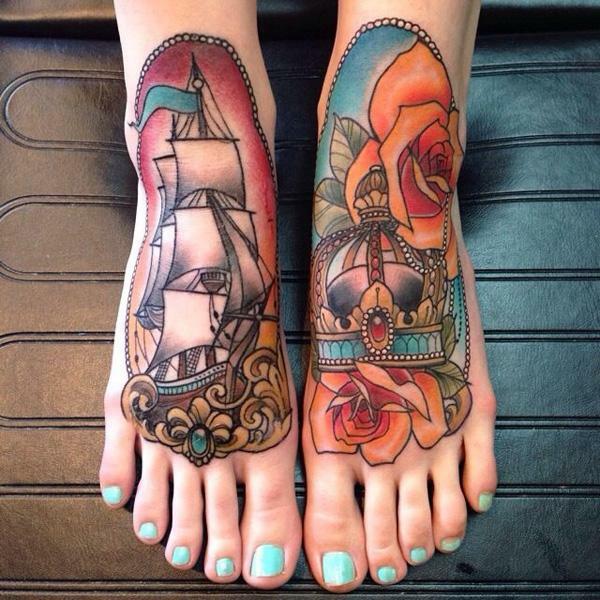 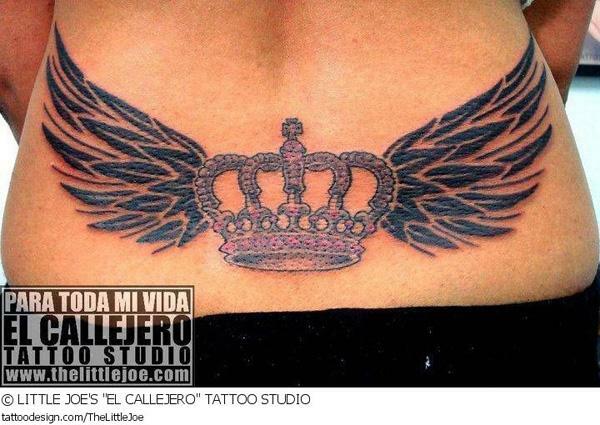 Both women and men often choose crown as their tattoo. 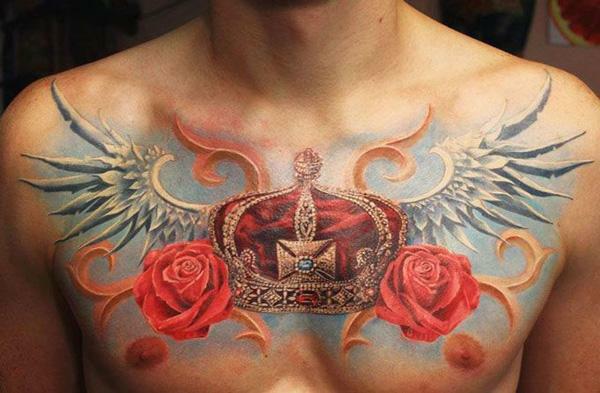 Male versions are more rugged, angular and simple, while female are often ostentatious with added flowers, and other elements of beauty. 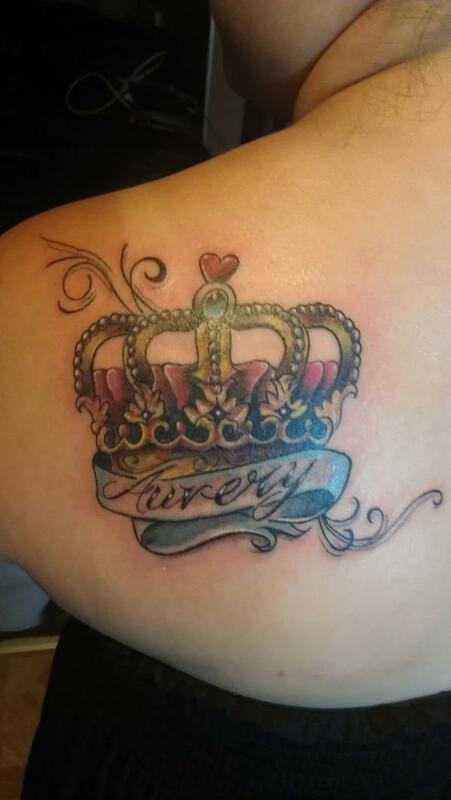 An important element of crown tattoo is lettering. 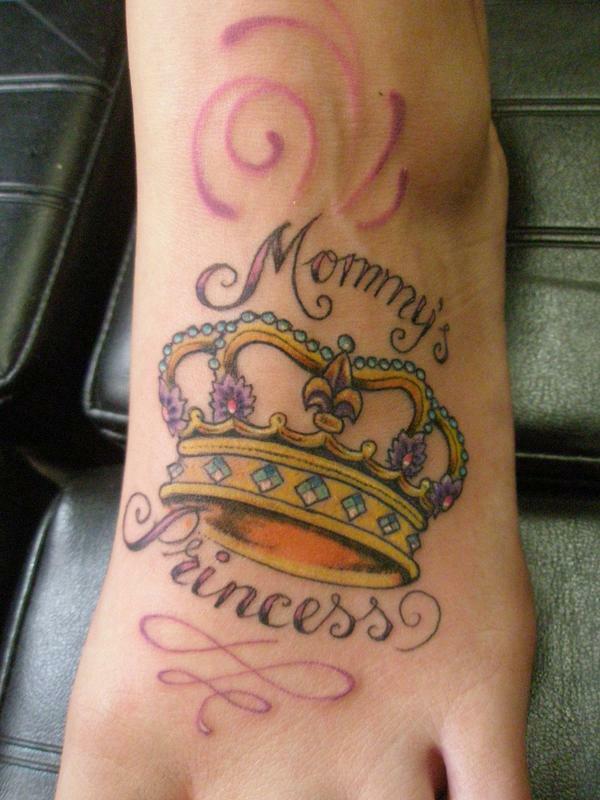 A person being tattooed can choose to sign their name, the name of their loved one or family members, or a life motto. 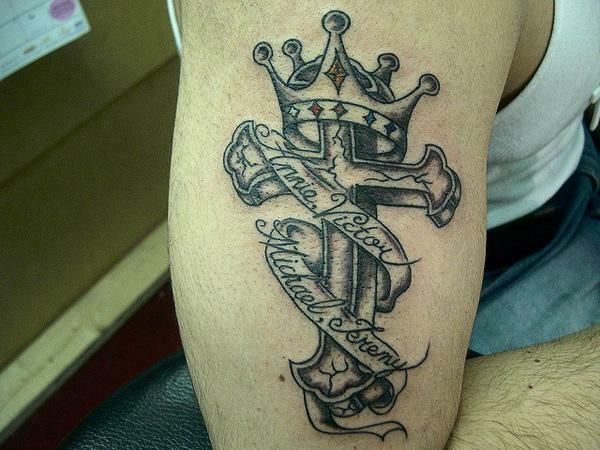 These letters are usually coordinated with the style of the tattoo, executed in calligraphic manner. 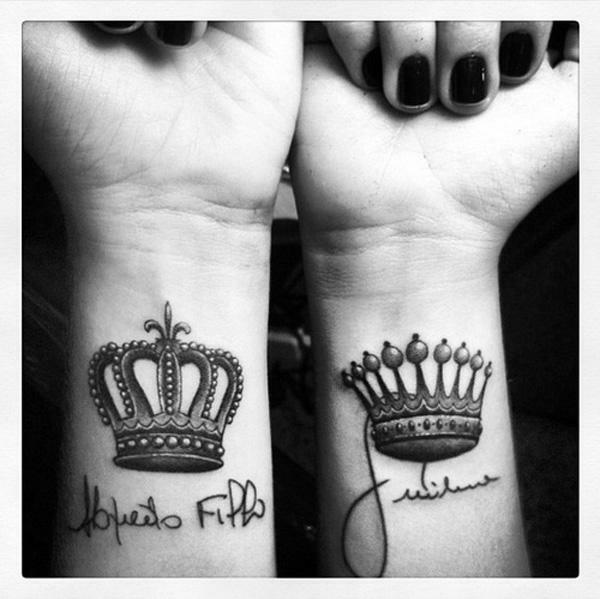 Crown can be placed over a writing, elevating an important person or message to the supreme level, or it the writings can be chiseled on a ribbon, waving around the image. 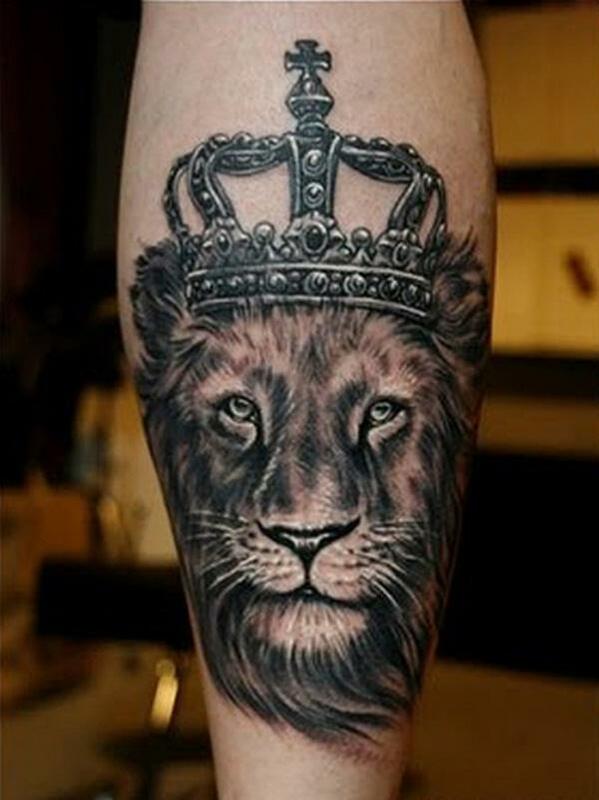 Among commonly employed visuals in crown themed tattoo pieces are skulls, signs of zodiac, animals, wings, rays of light, jewels etc. 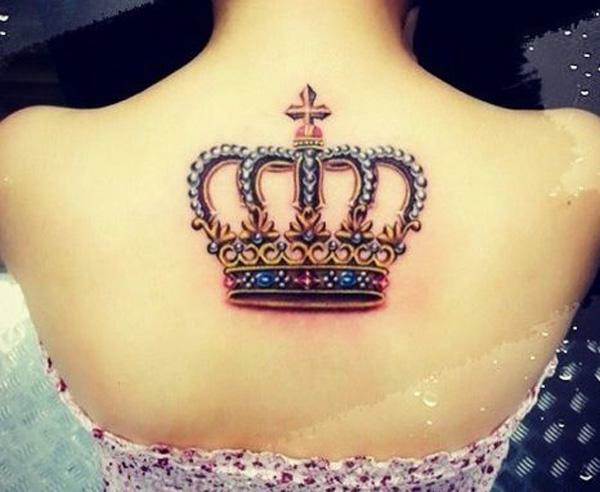 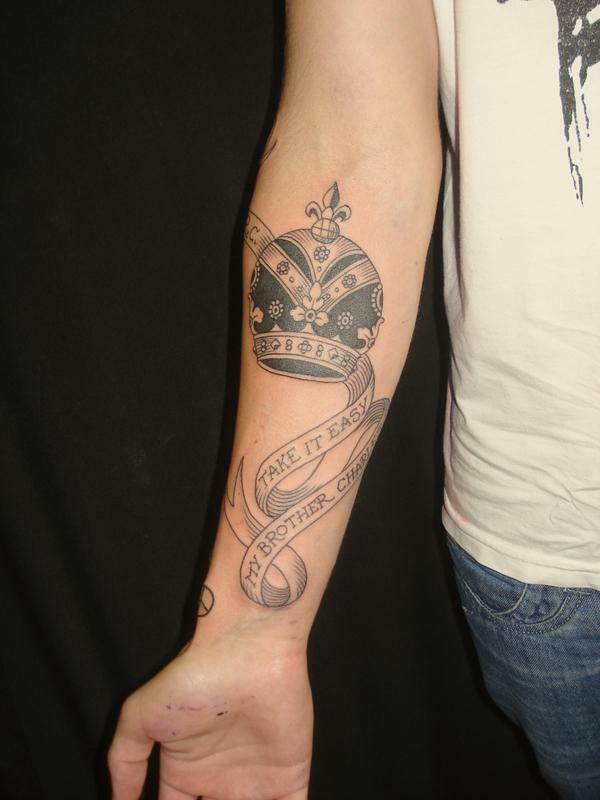 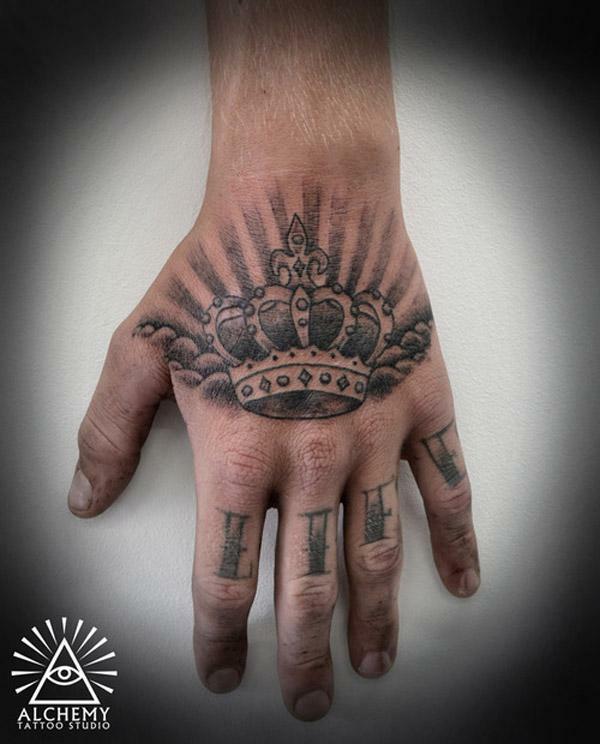 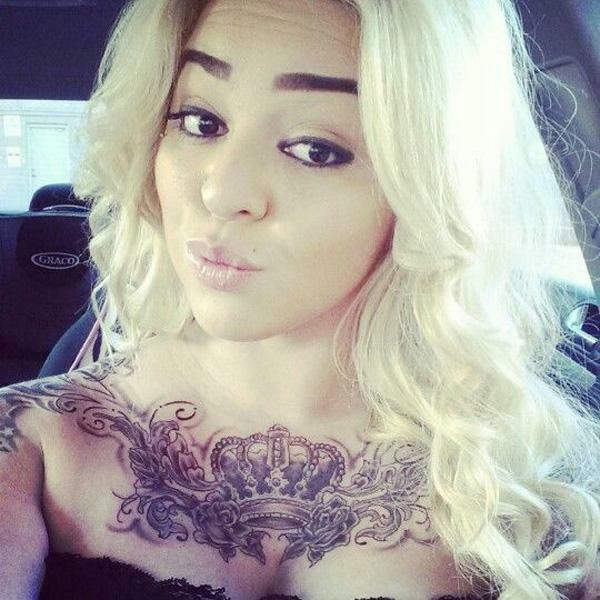 If you are thinking about getting a crown inspired tattoo, take a look at the collection of the most amazing examples, think carefully and invent your own symbol of individuality and potential, pertinent to your own personal ideals and ideas.